Aaron emphasized how the BATFE targets the innocent and vulnerable and how it damages the U.S. firearms industry. 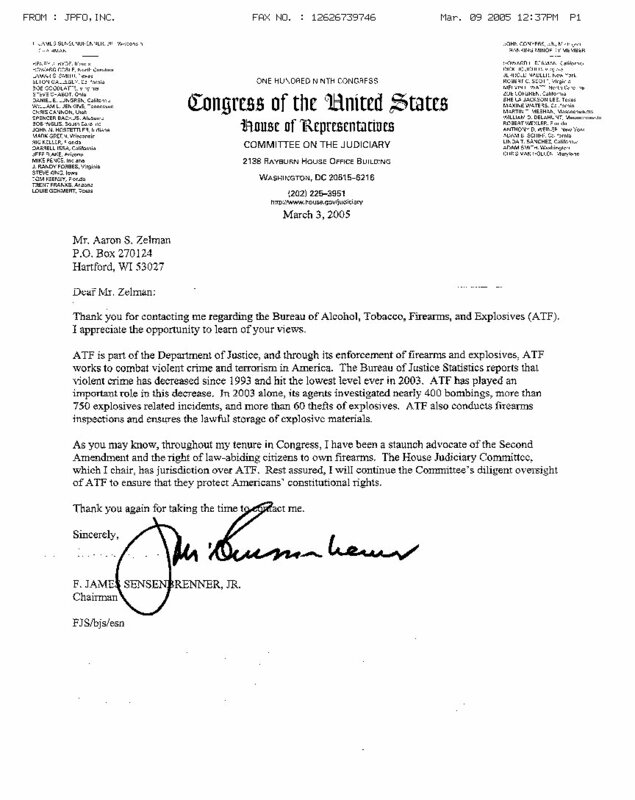 With the memo, Aaron enclosed a DVD of the JPFO documentary, "BATFE Fails the Test," which graphically shows BATFE incompetence and arrogance -- not to mention an attempt to frame an innocent owner of a semi-automatic rifle. James Sensenbrenner is the very powerful chairman of the U.S. House Judiciary Committee. Aaron Zelman lives in Sensenbrenner's district, making Sensenbrenner theoretically his "representative." Although the memo was a personal one from Aaron, Sensenbrenner is also well aware that one of the nation's most important gun-rights organizations is headquartered in his district. So what was Sensenbrenner's response? Did this "representative" of a gun-friendly district agree to call hearings? Did he respond to the memo with a request for additional facts or a list of potential witnesses? Did he examine the DVD? Did he even have an aide look at the DVD? Did he even write back to say he was aware of the abuses and that he intended to use his power to stop them in any way? "The ATF ... works to combat violent crime and terrorism in America. The Bureau of Justice Statistics reports that violent crime has decreased since 1993 and hit the lowest level ever in 2003. ATF has played an important role in this decrease." To call Sensenbrenner's letter a "response" is a misnomer. It was complete non-response. It was a false, soothing "there, there, ignorant little constituent" piece of junk mail that showed only that Sensenbrenner doesn't care about gun owners, about his constituents, or about abuses that are within his power to halt. In his meaningless screed, Rep. Sensenbrenner touts his 20 years of devoted protection of the Second Amendment. Frankly, we haven't noticed our gun rights improving under Mr. Sensenbrenner's stewardship -- and they certainly aren't going to improve as long as "Second Amendment supporters" glorify the misdeeds of the BATFE. Well, what can we expect from the man who sponsored the horror-filled so-called "Real ID Act"? And frankly, what can you expect from a high-ranking member of a party that repeatedly betrays its core constituency -- and gets away with it? Recently, we wrote an article pointing out that one reason most Jew don't vote Republican is that they perceive the R- Party to be a perpetrator of injustice. Most Jews may not be concerned with the rights of gun owners. But any person of conscience would perceive the outrage, the injustice, of allowing a federal agency to trample the rights of Americans. And it doesn't take much reading to see that Sensenbrenner's non-response is an insult and an outrage against all gun owners everywhere. Watch the ratings from the NRA, GOA, and other gun groups during the next election cycle. See who rates Jim Sensenbrenner highly and whose ratings reflect the freedom- destroying reality. Shame, Mr. Sensenbrenner. Shame on you for tolerating -- and even praising -- evil. Shame on you for your arrogance toward your constituents. Shame on you for your lying claims that you care about the rights of gun owners.